This paper has 15 questions. The Aptitude Simple Interest online Mock Test is Very helpful for all students. Now Scroll down below n click on “Start Quiz” or “Start Test” and Test yourself. S.I. for 1 year = Rs. (854 – 815) = Rs. 39. S.I. for 3 years = Rs. (39 x 3) = Rs. 117. Principal = Rs. (815 – 117) = Rs. 698. Mr. Thomas invested an amount of Rs. 13,900 divided in two different schemes A and B at the simple interest rate of 14% p.a. and 11% p.a. respectively. 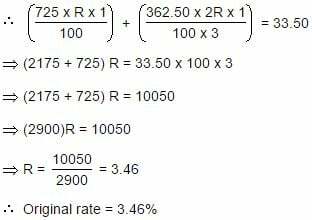 If the total amount of simple interest earned in 2 years be Rs. 3508, what was the amount invested in Scheme B? A sum fetched a total simple interest of Rs. 4016.25 at the rate of 9 p.c.p.a. in 5 years. What is the sum? How much time will it take for an amount of Rs. 450 to yield Rs. 81 as interest at 4.5% per annum of simple interest? Time = (100×81 / 450×4.5) years = 4 years. Reena took a loan of Rs. 1200 with simple interest for as many years as the rate of interest. If she paid Rs. 432 as interest at the end of the loan period, what was the rate of interest? Let rate = R% and time = R years. A sum of Rs. 12,500 amounts to Rs. 15,500 in 4 years at the rate of simple interest. What is the rate of interest? S.I. = Rs. (15500 – 12500) = Rs. 3000. A sum of Rs. 725 is lent in the beginning of a year at a certain rate of interest. After 8 months, a sum of Rs. 362.50 more is lent but at the rate twice the former. At the end of the year, Rs. 33.50 is earned as interest from both the loans. What was the original rate of interest? Let the original rate be R%. Then, new rate = (2R)%. Here, original rate is for 1 year(s); the new rate is for only 4 months i.e. 1/3 year(s). Principal = Rs. (100 × 5400 / 12 × 3) = Rs. 15000. S.I. for 3 years = Rs. (12005 – 9800) = Rs. 2205. Principal = Rs. (9800 – 3675) = Rs. 6125. A certain amount earns simple interest of Rs. 1750 after 7 years. Had the interest been 2% more, how much more interest would it have earned? A person borrows Rs. 5000 for 2 years at 4% p.a. simple interest. He immediately lends it to another person at 6 1/4 p.a for 2 years. Find his gain in the transaction per year.